Cedar Lodge Hotel is in the perfect location if you love gentle hill walks, rambling and exploring the beautiful Irish countryside. We have lots of beautiful walks around us; all you have to do is open the door and set off! Your only problem will be deciding which trail to follow first. Pick one of three easy waymarked paths around Carrickbyrne Hill, all starting about 5 minutes’ walk from the hotel. Carrickbyrne Hill is a lovely woodland known for its beauty and recreational opportunities. 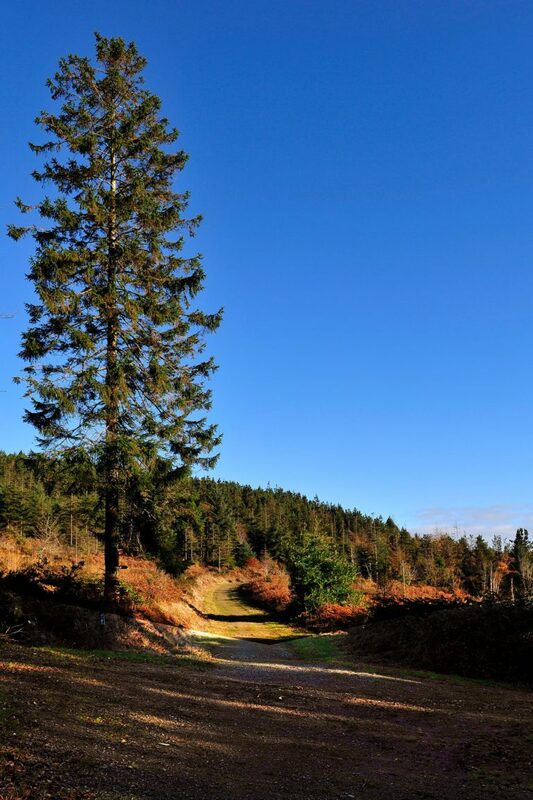 Just 23km from Wexford Town, County Wexford, Carrickbyrne Hill is an oak woodland growing on a hard volcanic outcrop, standing out as a solitary hill in otherwise flat countryside. Once part of the Jeffers Estate, this area was an important location during the 1798 Rebellion, where United Irish insurgents gathered in an area known as Camp Field as they got ready for the Battle of New Ross. As well as ancient oaks, you’ll find plenty of international trees growing on the hill, such as Douglas fir, Japanese larch, Scots pine, Spanish chestnut and more traditional British varieties like beech, ash and rowan. Bramble, heather and laurel blankets the ground, and as you walk, you may see a fox, hare or rabbit, serenaded by blackbirds and thrushes. The three circular blue, red and orange routes are all signposted and on a clear day you’ll be treated to gorgeous views of Mount Leinster, the Blackstairs and our pretty Wexford countryside. As you explore the trails, you might also spot standing stones, a forge, a cave and even an old castle. The red trail will take you about an hour to complete, while you cover 4.8km. The blue trail also takes about an hour over 4.5km. Alternatively, for a slightly shorter walk, pick the orange trail for a 3.7km walk lasting forty minutes. Or you might simply like to follow the forest walk to the summit. Lasting 5km, it gives you plenty of opportunity to survey the surrounding country views. In total, there’s around 12.5km of trails crossing Carrickbyrne Hill, giving you hours of rambling pleasure. 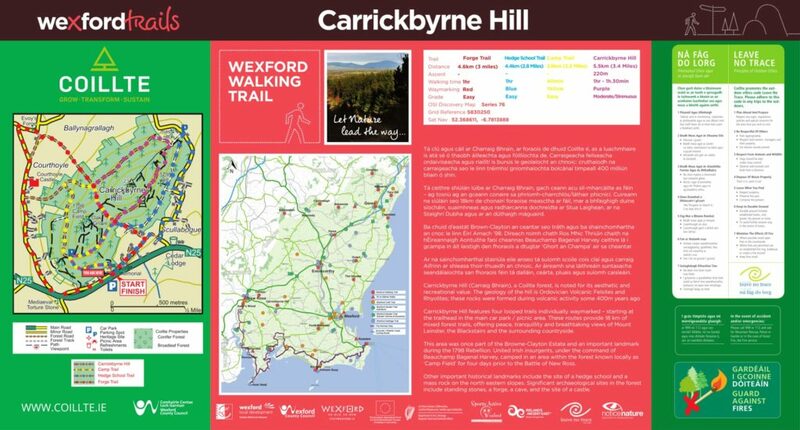 Click to download Carrickbyrne Hill pdf. John F Kennedy Arboretum. This has 252 hectares marked with various planned walks, as well as a massive labyrinth, playground, mini train, bike paths and café. (The café is only open during the summer months). Courtown Woods. There are four short walks available through this old woodland where you can spot plenty of wildlife. If you’re really lucky you might see otters playing around. The Three Rocks Trail. This trail covers 8km through Fort Mountain and Shelmalier, but if you’re with younger children, there are plenty of shorter loops to explore with idyllic picnic spots. Tintern Abbey. A shorter walk of around an hour, the Tintern Abbey Trails cover 3km of ancient beech and oak trees. Edenvale-Crossabeg-Castlebridge. This walk runs along a river, taking in a stunning waterfall and the ruins of an old house. If you enjoy salmon fishing, this is the perfect place for you. Dunanore Woods. Local legend has it that there’s buried treasure to be found in these woods, with a trail following the River Slaney, winding through 100-year-old trees. Curracloe Nature Trail. You might recognise this beach walk from the film Saving Private Ryan. A 5km trail winds through sand dunes for 5km, taking you through Raven Nature Reserve, where you can see red squirrels and other wildlife. Known as the sunniest county in Ireland, County Wexford is a sheer delight for hillwalkers, ramblers and countryside lovers. Come and lose yourself in our beautiful surrounds. Visit http://wexfordwalkingtrail.ie/carrickbyrne-hill/ for more information about our local area.